An estate plan includes the understanding of the accumulation, conservation, and distribution of the assets of an individual upon his or her death. At Schiller, Pittenger & Galvin, P.C., we offer a diverse range of estate planning services to achieve our clients’ goals, including but not limited to the drafting of wills, trusts, powers of attorney and advance healthcare directives. 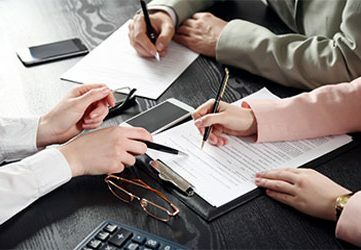 Our firm’s goal is to help our clients determine individual goals regarding the transfer of assets at death, how the government might tax those assets at death, and how each of those factors can be planned for to accomplish the goals of the client. In addition, our attorneys offer assistance with obtaining the appointment of an executor, and trustee, if any, designated in the will, or the appointment of an administrator; guiding the executor, administrator or trustee in undertaking the gathering of information as to the assets and debts of the decedent; and effecting the distribution of assets in accordance with the terms of the applicable document or the laws of the state. An estate plan includes the understanding of the accumulation, conservation, and distribution of the assets of an individual upon his or her death. Our firm’s goal is to help our clients determine individual goals regarding the transfer of assets at death, how the government might tax those assets at death, and how each of those factors can be planned for to accomplish the goals of the client. A will, which may include certain types of trusts, and/or trusts separate and apart from a will, are effective tools to be considered in the planning of an estate. A will is the personal declaration by an individual as to how that person’s assets should be distributed on death. If a person does not have a will, the estate generally will be distributed in accordance with the intestacy laws of the state in which that person was domiciled at death. The preparation of a will gives a person the control to make those decisions. Our estate administration services initially consist of assisting in the appointment of an authorized representative of the estate. This representative is the executor designated in the will or, absent a will, an administrator. In addition, there may be documents completed by the decedent during his or her lifetime that become effective at death but not included in the estate for disposition purposes. Our attorneys offer assistance with obtaining the appointment of an executor, and trustee, if any, designated in the will, or the appointment of an administrator; guiding the executor, administrator or trustee in undertaking the gathering of information as to the assets and debts of the decedent; and effecting the distribution of assets in accordance with the terms of the applicable document or the laws of the state. Should a dispute arise in connection with an estate planning document and you are seeking either to enforce or contest the validity of such document, our attorneys can help. We have in-depth knowledge of the Surrogate’s Court practice and procedure in both New Jersey and New York and possess the skill and expertise required for any estate proceeding. Our attorneys have handled cases involving the probate of wills, will construction issues, validity of trust documents, contested accountings for both estates and trusts, proceedings for the discovery and turnover of estate or trust assets, as well as numerous other trusts and estates-related matters. Our attorneys have significant experience handling estate, trust and fiduciary litigation. We represent clients in connection with enforcing or contesting a wide variety of estate planning documents, including the probate of wills, will construction issues, validity of trust documents, contested accountings for both estates and trusts, proceedings for the discovery and turnover of estate or trust assets, as well as other trusts and estates-related matters. Our attorneys possess the skill and expertise to handle any trust and estate-related proceeding. Contact Schiller, Pittenger & Galvin, P.C. today at (908) 490-0444 to see how we may be able to assist you.